You've found the “U.S. Broiler Chicken Breeders” page here at Hobby Farm Wisdom! If this is the first time you have visited our site: Welcome! Broiler chickens are a common breed of poultry raised solely for meat production. 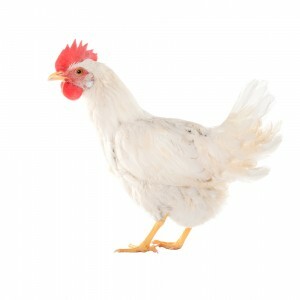 Broilers typically have white feathers and yellow skin and reach slaughter weight at 5 – 7 weeks of age. To facilitate the rapid growth at such a young age, these chickens are typically fed a special diet of high protein feed through an automated feeding system. Most are also kept under artificial light to stimulate eating and growth. Between 1925 and 2005, the days required to reach live-weight decreased from 120 days to 30 days. Due to these conditions as well as the artificial selection that has taken place in the breeding process, broilers are susceptible to many welfare issues. These issues include cardiovascular dysfunction, skeletal dysfunction, stocking density and ocular dysfunction.